A month away from the actual centenary of the Armistice which ended the Great War (November 11, 1918), commemorations are reaching a peak. Late last week, a carpet of 62,000 poppies – one for each of the ANZAC casualties – was unveiled on the lawns outside the Australian War Memorial in Canberra. At twilight, Paul Goodchild, principal trumpet with the Sydney Symphony Orchestra, played The Last Post on a bugle that was heard at Gallipoli a century ago. The following evening, ANU Llewellyn Hall was the locale for what was the most moving ceremonial concert I have seen in that auditorium since it opened in 1976. The Diggers’ Requiem is the final instalment of a four-year-long commemoration of the Great War by a local organisation known as The Flowers of War. It is the creation of Christopher Latham, well known as a one-time ACO violinist (1992 –98) of part-French heritage, director of the Canberra International Music Festival (2009 – 14) and ardent and unflagging advocate for Australian music. In his most recent manifestation, Latham is the inaugural artist-in-residence of the Australian War Memorial, a position that fits his curatorial vision and research skills like a glove. The AWM has long hosted the official post of War Artist; why not a musician as well? Using his considerable powers of persuasion, Lathan secured the support of the Australian War Memorial and the Department of Veterans Affairs in staging The Diggers’ Requiem. (Remarkable!) The lavishly illustrated printed program (another Latham hallmark) also credits the Australian Defence Force in providing band arrangements and musicians from the Band of the Royal Military College, Duntroon, and for three Requiem concerts, in Melbourne, Sydney and the final peroration in Canberra. There were perhaps 20 musicians in military uniform in the orchestra, and, ill-advisedly, Latham chose to wear khaki on the podium. There were close to 300 musicians involved in this presentation. A full symphony orchestra, bolstered by Duntroon players, and several soloists, notably the trumpeter Paul Goodchild, pianist Timothy Young and accordion player David Novak whose plaintive wheezes added another layer of grief to the sonic palette. 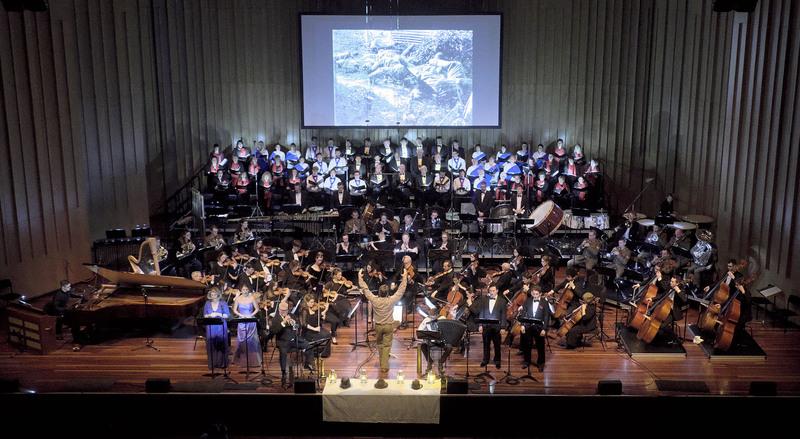 Four soloists – soprano Simone Riksman, mezzo-soprano Christine Wilson, tenor Andrew Goodwin and baritone David Hidden – led an array of voices, a massed choir forming part of the Australian War Memorial Choir and Orchestra. Eschewing the obvious model of Benjamin Britten’s War Requiem, there was no boys choir, no organ, no spoken narration, no Owen-esque symbolism of warring factions. We seem to have been spared repetitions of Britten’s masterpiece this anniversary year; it was fulsomely represented in Britten’s own centenary year, 2013. Following short and highly pertinent speeches by the Governor-General and the Ambassadors of France and Germany, the performance began in virtual darkness. Through the auditorium, a solemn procession of soloists bore army lanterns which were placed at the front of the stage. They trudged to the euphonious orchestral strains of an evanescent new work by Elena Kats-Chernin, The Silent Field, dedicated “to all military and civilians of war”. And so the audience became soldiers in search of fallen comrades, her music piling on an aura of loss and bewilderment. Two solo voices, French soprano Simone Riksman and the Canberra mezzo-soprano Christine Wilson, launched into a word-less trudge of Handel’s Dead March from Saul, the archetypal march played at Commonwealth military funerals during the First World War. Like many in the audience, I was almost jolted from my seat when Handel leapt from pp to fff on the introduction of the full chorus. It was the first of many dramatic strokes to come. For this event, Lathan had commissioned short new works from six Australian composers (in order of performance) Elena Kats-Chernin, Nigel Westlake, Graeme Koehne, Richard Mills, Andrew Schultz and Ross Edwards. (Note also the absence of the didjeridu and the music of the late Peter Sculthorpe, staples of previous Latham enterprises.) With the exception of Richard Mills, preparing performances of Pelléas et Mélisande in Melbourne later this week, all composers were present. The 14 movements of the piece were loosely structured around the Latin Requiem Mass. Each movement focussed on a particular theatre of war, illustrated by projections of photography or sketches by war artists. For all the care given to the narrative of each composition, there seemed little more than titular correspondence between the music and the images. Perhaps future exercises of this nature might also engage a film editor to ensure quality of the images and correspondence to music and narrative. Within the 90-minute structure, performed continuously without intermission, there were some memorable highlights. Simone Ricksman’s glorious singing of Graeme Koehne’s Pie Jesu moved many to tears. In his Sanctus movement depicting the demise of the Red Baron, Nigel Westlake had the genesis of a cello concerto, which was handsomely delivered by Simon Cobcroft, principal of the Adelaide Symphony Orchestra. Andrew Schultz’s homage to General Monash and the AIF, Harmonia Belli, was a thunderous and frightening evocation of the actual percussion of battle, on the ground and in the air. There was a certain similarity to much of the music. While this gave cohesion to the disparate sections, it also highlighted what an ancient poet called “the benefice of difference”. Understandably, much of the music was filmic, despite being composed away from specific images. The most striking orchestration came from Richard Mills, whose huge sweeps and glissandi at the opening of his Charge at Beersheba were both graphic and captivating. I wondered, though, had any of the six composers sought out other, more angular and discordant war-music, perhaps the likes of Grainger’s The Power of Rome and the Christian Heart or the Lusitania movement from the Second Orchestral Set of Charles Ives? Still, there were echoes of earlier music. A recently discovered piano sketch by Frederick Septimus Kelly, Lamentations of the Somme (October 1916, penned two weeks before his death) was inflated into an orchestral miniature. Alex Lithgow’s Victoria March was played by the AIF Band as they marched into the newly liberated French town of Bapaume. This music was interpolated between two new movements, The Glass Soldier by Nigel Westlake and The Bomb by Graeme Koehne in which Paul Goodchild’s seraphic solo trumpet deftly avoided direct references to The Last Post. Perhaps the most striking of many memorable moments was a visual one: the image of Goodchild, trumpet by his side, standing, back to audience and spontaneously gaping at images of the destruction of the great cathedral of Amiens. Had there been more moments of this kind, the inherent theatricality of the work would have burned in the memory. The last movement of the cycle should have been the Lux Aeterna and In Paradisum by Ross Edwards. His music encapsulated the distant sound of a sole bagpiper intoning the Lament for the Pipers Lost in the Great War by Major John Grant (1876 – 1971), played in the upper galleries by piper Jordan Aikin. Soprano soloists guided the music to the kind of celestial heights Edwards approaches in his vocal symphonies, redolent at times of Mahler’s Resurrection. Every minute or so, another layer was added. It culminated with the tolling of handbells which began to immerse the audience, as players emerged with the 100 bells made for the Centenary of Federation in 2001. Ever more gradually, a tape of over 62,000 bells recorded and processed by Kim Cunio from bells all over Europe, slowly engulfed the auditorium in a tintinnabulous tsunami of bell-ringing. It was both an uplifting and terrifying moment, and with its sudden close, many in the audience, utterly sated and exhausted, felt the performance had ended. At that point, Latham turned to the audience and took a microphone to instruct us in singing a chant on the words Pie Jesu to accompany his own closing Prayer for Peace. At that point, the sheer magic so carefully woven over the previous 90 minutes was shattered. There had been a full dress rehearsal the previous evening. Surely, Latham would have sensed the danger of this moment. It served to highlight once again the clear need for a producer for these enterprises. These enormously complex and often unwieldy exercises require someone to stand aside of the conductor’s podium, to direct and give advice and caution. One person alone cannot possibly contend with so many dimensions. Had this been a production by a major symphony orchestra – as indeed, we hope that it should and will become! – there would have been around 100 people involved in its production and execution. There were other shortcomings that could have been avoided too. The clumsy moves through a thicket of music-stands, especially at the long line-up at curtain call where the Governor-General struggled to maintain protocol composure on stage whilst signing Latham’s score. Better placement of projection screen/s would have prevented the splintering of images by ABC microphone cables. Had there been just a little light in the auditorium, the audience may have been able to follow the concourse of events from their printed programs. But these observations in no way detract from the admiration and appreciation of what was a truly extraordinary enterprise, rewarded by a sustained standing ovation and cheers at the end. In almost every sense, the work itself transcended the imperfections of its execution. One trusts that the AWM will recognise and take pride in their investment. Long may this association with The Flowers of War continue and flourish. Long may they remind us of the folly of war and plead the urgency of peace.